Once again, Friday Happy Hour takes a look at the Cocoran’s ARTINI 2011 Each of the twelve participating bars have a created a special cocktail inspired by works from the Cocoran’s collection which are on offer leading up to the April 2nd gala. Each bar gets one “feature night” when their creation is showcased and a portion of the proceeds is donated to the Corcoran – though the drink continues to be available the entire month. 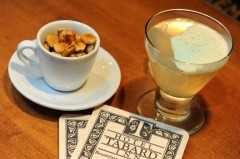 Featured this week: Tabard Inn, PS7′s, and Church & State. This is the mid-point among the feature nights, with six more bars still left to be featured. Next week, we will be drinking at Cafe Atlantico, Potenza and Art and Soul.